174 pages | 61 Color Illus. Criminal Law Q&A covers the general principles of criminal law, homicide, non-fatal offences against the person and sexual offences, general defences, modes of participation, inchoate offences and vicarious liability, and offences against property. 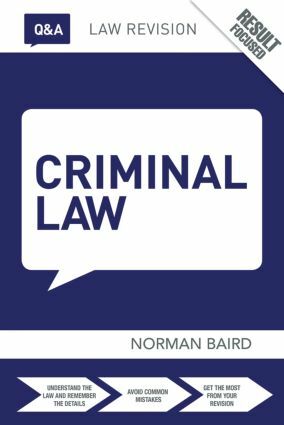 Norman Baird is a former consultant to the University of London International Programmes, Undergraduate Laws, publisher of Criminal Law Online (www.criminallawonline.com) and director of QED Law Revision Seminars (www.qedlaw.co.uk).